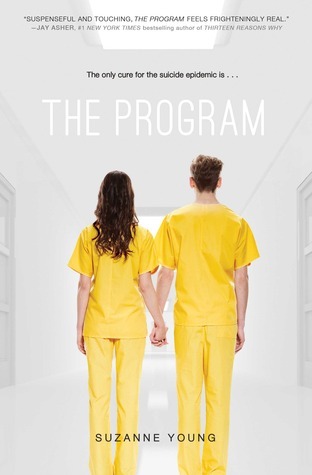 Out next Tuesday is a new book from Suzanne Young, The Program. This is one I beta read, and it’s a book that holds an incredibly special place in my heart. But this isn’t a review, exactly. Not just because I’ve been with this book from the start, but because I know, my view on it, is usually seen as biased. But this book? The immense amount of love I have for it has everything to do with the book. I love Suzanne dearly, she has been the single most supportive person in regards to my own writing, and she’s taught me more than words can express. And in truth, it’s reading books exactly like The Program, even from the raw first pages, that have made me a better writer. I’ve said it before, and I’ll say it to anyone who listens, Suzanne is genuinely one of the single most talented writers I know. Her raw, not even edited by herself, stuff is often better than some of the finished stuff out there. And I don’t say that out of friendship, I say it out of truth. As a reader, and as a writer, she very often leaves me just utterly stunned. The Program left me stunned. From the first pages I read, to when I finished reading the very first draft. I didn’t know what to say. I didn’t have that many criticisms. I actually felt very useless as a beta reader, because I just didn’t really see too many flaws with it. I was so captivated by the world, the characters, the story and the writing, there was almost no room, for me, for negative stuff. Yes, I took time, digested, figured out the niggling feelings of where things were off, or needing more explanation. I found some inconsistencies. I did my job. But it wasn’t an easy job for me to do, not like I’ve experienced with other authors, other books. I. Love. This. Book. The elements, the themes, the concepts. All of it. It challenged me and made me think. It broke my heart, and left me emotionally wrung out. And that was in the very first draft. I’ve read this book four times now, in all it’s forms. I’ll read it again once I get the finished copy. And I know I will continue to love it, continue to be enamored. What would you do, if everyone around you was being taken away? What if the only way known to stop an epidemic is to wipe out your memories, restart you, and take away all the bad that’s happened in your life? And how much of that… is erasing you? What would you do, if showing any kind of adverse emotion, even normal ones, risked getting you flagged and taken away? Those are just some of the things Suzanne tackles in this book, however intentionally or not, however subtly or more clearly. I felt so, so much for Sloane. And though, yes, she was infected, a huge part of me, even now, will argue that she was less infected, and more affected. Affected by the loss of her brother, of her friends. Torn apart by losing her boyfriend, who isn’t dead, but maybe even worse—erased and restarted. When you’ve lost everyone around you, how can you not be sad? Except being sad, means she’s infected, at least in this world. Sloane’s story is a painful one. It’s one set in a world that doesn’t exist right now. And yet, despite the dystopian type elements, I wouldn’t really classify this as one. It’s romance, as all of Suzanne’s stuff is. It’s figuring things out, it’s fighting back, it’s fighting for you. It’s a blend of things, and it’s something that left me breathless, and thinking about it for weeks. This is one of those books I remember details of so vividly, I actually am almost scared to talk about it specifically because I can't always remember if those vivid things are from the final version, or an earlier one. But one scene, that I believe is in the final version, is on the beach, not long before James goes away. And it’s one of the palpably emotional, intensely sad scenes I’ve ever read. It’s a scene I wanted Suzanne to fight to keep, if it came up to cut it, because it struck me so much. There is something so amazing about the relationship Sloane and James have. These are the kind of characters who are so perfect for each other, I can't imagine them ever with anyone else. And yet, they get broken apart, their memories of each other are taken away. It’s an element that made my chest ache throughout so much of this book. And it’s an element I think we can all connect to, no matter our experiences. And that’s the talent I think Suzanne has, so beautifully portrayed in this book. It doesn’t matter where you come from or what you’ve been through. There’s something of all of us in her characters, this innate universal connection which she forges. At least, through my eyes, it’s there. So do yourself a favor, and check out this book next week. I’ve been waiting, alongside Suzanne, a long time for it to come out. I can't believe it’s finally here. I can't wait to hold it in my hands. This book is, hands down, my favorite thing of everything I’ve read of Suzanne’s, published and otherwise. I am proud beyond of words of Suzanne, and can't express enough how dear this book is to me, and just how intensely I adore it.